Each year, the Webb County Heritage Foundation recognizes individuals, businesses, organizations, and families that have contributed to the unique architectural and cultural heritage of Webb County. The Foundation invites you to nominate those who have made significant contributions toward preserving the heritage of Laredo. These significant contributions may be in the areas of historic preservation, rehabilitation, and /or conservation of buildings, documents, photographs, traditions, folklore or customs which enrich community life in Laredo and Webb County. Deadline for nominations is March 15, 2019. Awards will be announced at the Webb County Heritage Foundation’s Founders’ Day Celebration. For category information, please call the Webb County Heritage Foundation office at (956) 727-0977 or stop by at 500 Flores Ave., Laredo, Texas 78040. Presented to recognize and encourage research and documentation of regional history through the publication of original material which preserves records or recounts local or regional history. In recognition of those individuals, organizations, foundations, or associations making significant contributions toward the adaptive reuse of historic structures within Webb County. Recognizing individuals, institutions, organizations, foundations, or associations located outside of Webb County, including Mexico, which have made significant contributions in the field of historic preservation and cultural awareness in Webb County. In recognition of those individuals, organizations, foundations, or associations making significant contributions toward preserving the heritage of Webb County. In recognition of those individuals, organizations, foundations, or associations making significant contributions toward preserving the environmental heritage of Webb County. Providing recognition to individual and organizations making significant contributions of time, talent, or treasure to the preservation of Webb County Heritage. In recognition of efforts by a business organization to illuminate the history, architecture, and folklore of the region. Recognizing the design and constructions of new buildings incorporating traditional design elements and/ or methods. In recognition of contributions of time, talent or expertise in the promotion of the programs and services of the Webb County Heritage Foundation and the Republic of the Rio Grande Museum. In recognition of the perpetuation of folklore, customs, and traditions which add to the quality of community life in Laredo and Webb County. For the generous patronage of the Webb County Heritage Foundation archives by the donation of a gift of historical photos, documents, records, published materials, or artifacts that recount or reflect the history and heritage of Webb County and are made available to the public. 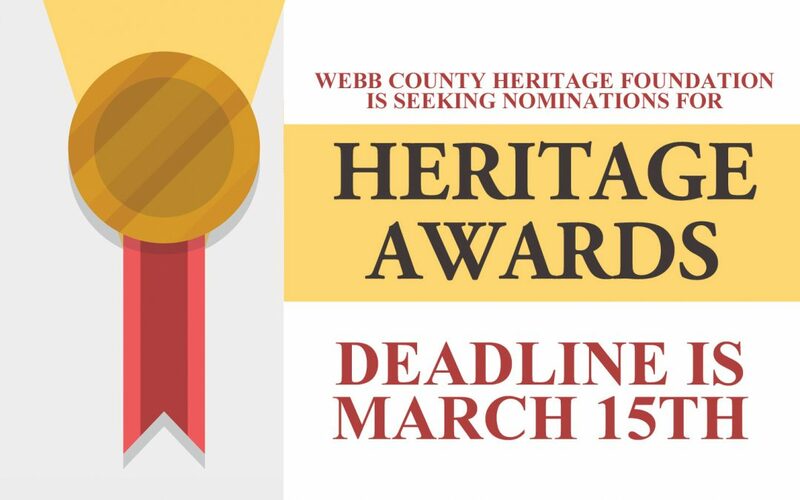 In recognition of individuals, institutions, or organizations who have made significant contributions to the preservation of Webb County Heritage on a continuous basis. In recognition of students, individual under age 18, or youth organizations, foundations, or associations making significant contributions toward preserving the environmental heritage of Webb County. In recognition of outstanding achievement by a student, teacher, or administrator in the Laredo History curriculum. Download the 2019 Heritage Award Nomination Form here!